How many sites do you manage? Guessing it might be a few, but let me ask you this: how many of those sites did you get paid for signing up at Winhost? Not quite as many, I’m guessing. 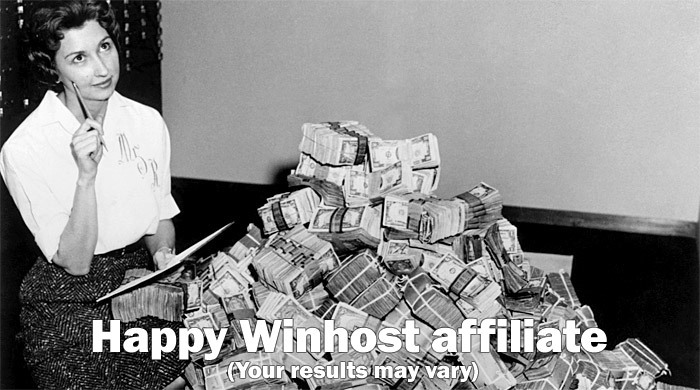 So maybe it’s time to take a look at the Winhost Affiliate Program. The Winhost affiliate program isn’t anything new, but I understand if it isn’t the first thing you think about when you come to Winhost. I mean you have to think about your current sites, databases and domains you may have with us. An affiliate program is probably the last thing on your mind. But let me tell you why you might want to move it up on your list, at least when setting up that new site with us in the future. With the Winhost affiliate program, we will pay you a commission of 60% of the hosting fees paid at the time of purchase. I know, giving you just a percentage probably isn’t helpful so let me break it down for you. Say you sign up a new Max plan hosting account on the 1 year billing plan. The hosting fees paid at the time of purchase would be $119.40. As an affiliate you would receive a commission back to you of $71.64 (60% of the fees paid). That commission can then be paid back out to you, or put towards your hosting account as credit, it’s up to you. We also offer special incentives for those who sign up 15 or more sites a month using the affiliate program, including higher commission rates and flat rate commissions. You can get started with the Winhost Affiliate Program here. When you scroll down to the bottom of the page we have a quick form to fill out where we ask for the standard information (name, contact info) and have you create your affiliate ID and password. All affiliate payments are paid either via PayPal or as hosting credit, so we also require a PayPal address when signing up. After you sign up you will have access to our Affiliate Control Panel where you can view reports on sales made with your affiliate ID as well as request payments and view marketing creative that you can use on your site if you wish to. If you have questions about our affiliate program, we are always happy to answer them. Just drop us a line at affiliate@winhost.com.